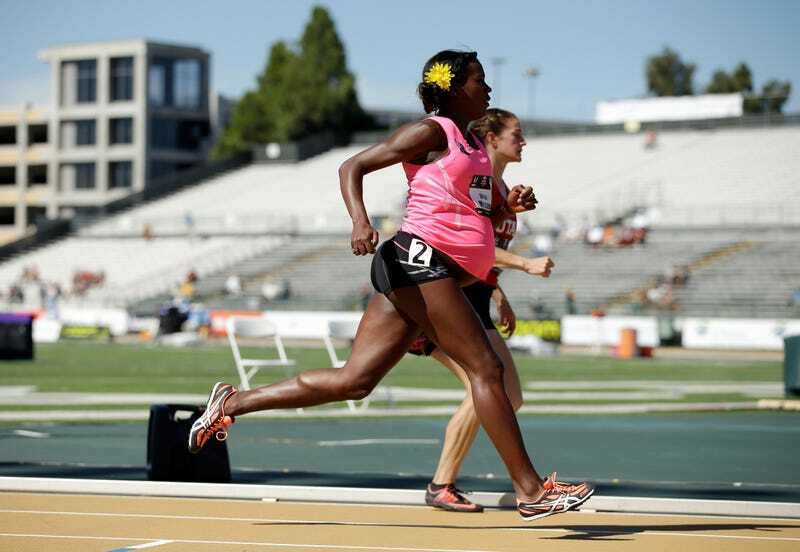 Thirty-four weeks pregnant Alysia Montano competed in the 800 meters race on Thursday at the US Track and Field Championships. With seven weeks left before she's due to give birth to her first child, the five-time national champion trailed the lead pack for most of the race and finished last with a time of 2 minutes, 32.13 seconds. I've been running throughout my pregnancy and I felt really, really good during the whole process," Montano said. "I just didn't want to get lapped and be the first person to get lapped in the 800. The 28 year-old was never lapped and received a "rousing ovation" when she crossed the finish line. Because the Internet is the Internet, I've seen plenty of people commenting that she "shouldn't be running" and that it's "probably not good for the baby." Wrong. She took a nice relaxed pace from the start and maintained it throughout. That was according to the plan Montano laid out after consulting with her physician. Not only did doctors give Montano permission to run, they encouraged her. Imagine that! An active, healthy adult woman and soon to be mother who probably cares very much about the health of her child, consulted medical professionals and made a decision that works best for her. Montano is happy to be able to challenge notions of what a woman is able to do while pregnant. That took away any fear of what the outside world might think about a woman running during her pregnancy," Montano said. "What I found out mostly was that exercising during pregnancy is actually much better for the mom and the baby. Her baby is going to have an amazing story to tell his or her friends one day about the time they competed in a major US track and field event with their totally badass mom.